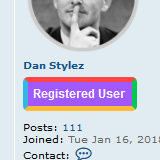 Can Rank CSS be added on here something like what Xenforo has I would to use it on my board thank you Phpbb3 team. What do you mean by rank css (not all of us have used xforo)? yep, have no idea what "rank css" even means, much less "postbit". I think this refers to using CSS for user ranks so they can be customised more rather than just images. Just finished writing it for our last massive extension... with ACP control about colors, lettering and languages. I would have to extrapolate the code to make a single extension. That's exactly what I am looking for where do I find it! Nowhere at the moment, did you read my quoted post? Sorry Off Topic, but this is NICE work Marco!!! Yeah, thanks. When I imagined it (on request) I didn't know it existed for some other system (so to lurk) and so I pulled it out of my hat. You should actually make it official as I am really looking to use it on my Forum! Who knows.. actually that's not in my plans. No spare time . It is very well integrated into our extension and that's enough for us, atm. Wouldn't it be more flexible to just provide the CSS itself in one single textbox? The administrator would only be able to create/modify it anyways, so any possible harm thru evil code can only be self-inflicted. As I said it is not in my plans to make it a stand-alone extension atm.